Has anyone seen Flash? It's a common scenario. You download a cool Flash-filled site only to find out later that the site didn't stay after you closed your browser. Up to now, offline viewing of these sites has been impossible. Fortunately now, Flash can be trained to sit...stay... and be saved, giving you offline interaction with your favourite Flash sites thanks to FlashJester's pet project! 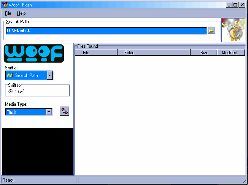 Meet Woof, your faithful companion for Flash retrieval, who will search your local drives, Netscape or Internet Explorer looking for Flash files, Real Audio files and JPEGs to fetch. Woof then brings you a list of what it found, allowing you to browse through the sites on your own time. Woof is one-of-a-kind, with a unique pedigree no other product can match. Take Woof home today! Click here to become a proud Woof owner. It's barking mad ! Such a useful toy.